HomeJewellery Manufacturers Discover the most advanced CAD with key tools for fabrication of jewellery and organic modeling. Discover the most advanced CAD with key tools for fabrication of jewellery and organic modeling. Elements make RhinoGold 6 the right choice for jewellery professionals. Amaze your customers with the new Digital Jewellery Application that has revolutionised the concept of showcasing and selling jewellery online. With its easy interface and fast editing tools, CAD is a must-have tool for all jewellers. The world markets are changing. Branding, good design, high-quality, low margins, fast turn-around times, and great service are just a few of the challenges that manufacturers and retailers face today. 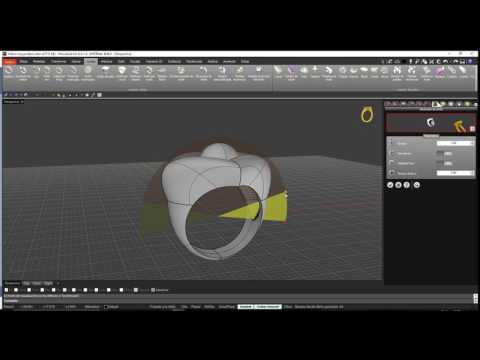 Watch RhinoGold create a hollow ring! Read more about how 3D printing will impact the jewellery industry. CAD offers the benefits of cost-effective, custom products without the impracticality of a large inventory.